Scooter Simms	Be My Friend! I just know you are loving having a family though its the best. I’m so happy you have a new baby to help you blog. It didn’t seem right without him. Scooter is beautiful (I should say handsome). He is lucky to have you for his human mommy. Have a great weekend and a wonderful 4th of July. You are GORGEOUS! Can I say that about a boy dog? OK, you are very HANDSOME. And you have a wonderful smile. 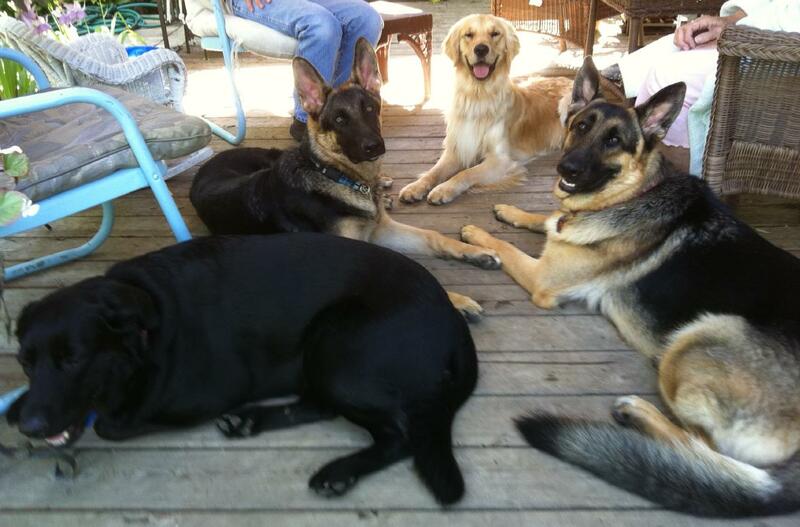 So German Shepherd dogs DO speak English! I’ve always wondered about that. Thanks, Scooter! Scooter – Once upon a time I had a dog who was not allowed on the furniture. But Molly figured out how to get on the couch. She would wait until I was comfortably settled in, reading. Then, she would just put her chin on the couch, and wait for about fifteen minutes. She was so cute, I couldn’t scold her. Then, she put one front paw on the couch, too. Still cute, and I still didn’t scold. So after another fifteen minutes, she put the other front paw on the couch, and waited. It was too cute, and by this time I wanted to see what she would do next. Sure enough, about fifteen minutes later, she quietly wiggled her midsection onto the couch. While I pretended to be reading, she put one back leg on the couch. By now, I could hardly contain my laughter. But I kept mum, and I think she reasoned that, with one foot on the floor, she was technically not on the furniture! But fifteen minutes later, the last leg found its way onto the couch. Now, mind you, her rear was still hanging off the couch. Finally, after another fifteen minutes or so, she wriggled the rest of her self onto the couch. I think she thought I hadn’t noticed. I was so impressed at how patient (and tenacious) she was – it had taken over an hour and a half to get onto the couch. How could I scold her? And, the older she got, and the older the furniture got, the more tolerant I was of her behavior. Just hang in there. Your mom will cave in – just be patient – and winsome! My cat “sneeks” up onto our laps when we are reading on the couch too. I always laugh thinking” Does he really think I don’t see him”? He slinks up just like he sneeks up on little lizards and mice in our back yard. It really is cute to watch. Glad to see that Scooter likes to blog too! I will be looking forward to more blogging from you! Welcome Scooter to blogland…sounds like you have found a wonderful forever home. I am the “mom” to Riley, a half golden lab/half Australian shepherd. He too had trouble at puppy school,with barking and wanting to play with the other dogs instead of learn. And he got so excited about a squirrel, he just about went through a screen. 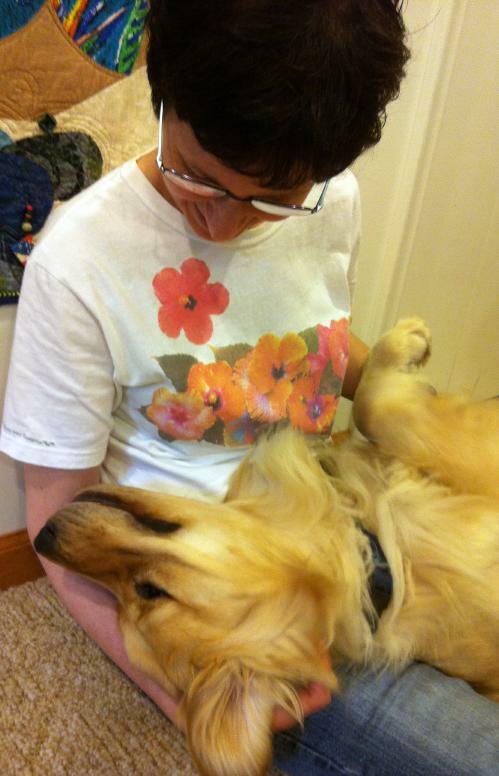 Anyway….look forward to reading more on your blog, and be a good dog for your mom. Is that growling or snoring? My 12yr old Cattledog snores at times when really tired. Love the name Scotter and so glad you have a wonder forever home. Both of our heelers are rescued and live in their forever home. It’s me, Sasha in beautiful Washiington. I was always getting in trouble at dog school for barking during class. Hang in there, I ended up getting a beautiful ribbion for most improved dog. As for the furniture my mom didn’t think I needed up either, but I have slowly trained her with wonderful kisses so I can join her in her recliner. I only get to do this in the morning, but mom has finally figured it out. Morning Scooter: You are improving daily I am sure, learning new stuff just takes time and your Mum obviously adores you, and will show you exactly how things are done. Keep that tail awaggin’, and keep those paws ablogin’, and before you know it, you will be graduating from obedience school, and maybe even mastered the art of squirrels in trees. Be a good boy and we will talk at you later. It’s great reading your blog Scooter…hope your Mom doesn’t mind you taking over her work. I love reading about your adventures…please write more!! Scooter, this is Ellie. I am a Border Collie and I am just two, also. There is this cool game you can probably still play while you are learning the rules. After THEY know that YOU know the rules, you probably won’t get away, I mean, want to play it. I had tons of fun with this for the first month when I came to my Forever Home. Here’s how you do it…and it’s great for an indoor workout, too. You start in the kitchen, get up a full head of steam, rip around the corner (toenails on carpet help here) through the dining room, then head straight for the forbidden couch. When you get about 5 feet away, launch yourself at it, hit the back of it with all 4 feet, and sprrrriiinnngg yourself off. Land, still running, head back to the kitchen, and go for another circuit. For additional cardio work, you can include a trip up and down the stairs in the circuit, but try to do it only touching every 4th stair. Way fun. While it lasted, anyway. Hi Scooter……Glad to see you are adjusting to your new family…….sometimes it takes a while, but you’re doing quite well……and very quick!! Hi Scooter, My name is Sasha. I am a Samoyed and am 7 years old. On July 10th I will be 8. Having people friends is so great. I love it when they give me ear massages and tummy rubs. Your Mom sounds great!!! I will give you some tips to help you when you go to see the vet. If you are on your best behavior they will give you treats. I love it!!! I walk nicely up to the scale to be weighed and just sit there. They pat me on the head and rub my ears. It feels so good. Walk nicely into the exam room. They give you more pats and hugs in there. I get show off and show them some of my new tricks and doggie moves. They ask me to shake and I get another treat. They ask me to sit and praise me and say I am a “very good girl”. It makes me feel so happy when I hear those words. Trust me on this one. Don’t be afraid of the vet. They are great!!!! Another tip. If you hold real still while they give you the shots it does not hurt hardly at all. The same goes for getting your nails done. Hand them your paw like you are going to shake, it goes really fast and in no time it is all done. The part I like the best is getting to go in the car for a ride. I just love car rides!!!! Have fun with Ami. Yes, we are so lucky to have great Moms. Scotter, you are such a handsome young man and so smart that you are already blogging. Do believe you are snoring — hope it isn’t sleep apnea. Oh, so sorry I mispelled your name — I know it is Scooter. Scooter, I’m glad you have come to live with Ami. She was so lonesome after Madison went over the Rainbow Bridge. You are very handsome. My cat, Spunky, saw your picture and altho’ he isn’t very interested in dogs, he does send you a soft meow wishes you well in your new home. Scooter – Hi, my name is Thor, my humans say I am a Labordoodle (a new name for a mix breed). I have longggg leggs anf a long snout and a lab body like my mom. I have a friend that looks like me with really long hair, but he is called a goldendoodle. I use my long legs to almost get on furniture. I put my chin on my dads knee, then just keep creeping up. I .put my chin on his shoulder and still have my back feet on the floor, the secret is to just let your front legs relax. I also have learned the lean, When someone starts to pet my head, I just get rubber legs and lean into them, I get an all over pet that way. I also try to play with the squirrels. I have a friend that is a doe. She likes to go on walks with us, but she stays on the other side of the road and a little behind. She does not have any deer to play with, so I let her walk with us. The reason you can’t climb trees is you’re a Dog, and Dogs have different collar bones than Cats. We can wrap our paws around a tree, but you can’t. Don’t worry about it. No one will think less of you for not climbing trees. Dogs pee on trees. No self respecting cat would do that. The most important duty you have as Dog is to keep your Mom happy, and not let water come out from her eyes. That means that Moms are unhappy. Sometimes our Mom does this, so we purr real loud and stay close to her. Oh, and you must not play with her quilt stuff. In time she will make you a Puppus Doggus quilt. Our Mama makes us cat quilts. Misty Whispurrs, and Sebastian, who have a facebook page and a blog site on “blogger”. HI Scooter. My name is Jill – I only weight 7 lbs but I get along with big boys very well. It’s those other little dogs that are a pain in the behind. Being so small I’m allowed on the furniture – I love to sit on the back of the couch and look out the window. Then I start barking at the dogs walking past my house with their moms – my mom is trying to train me not to bark at them – sometimes I just growl a little instead of barking. Love you, Scooter. I’m so happy that you have the doggy-home that you deserve. There is NOTHING like a golden. Come and live with me Scooter you can sleep where ever the mood takes you! I am a Jack Russell called Twiglet and I think I am in charge here so not too sure how I would cope with you sharing my space! I am sure you can eventually train your Mom and Dad into your ways! By the way I always thought German shepherds spoke German, as a JR I definitely speak English but I can understand American quite well. I am quite lucky as I go with my Mum and Dad to England twice a year to their home there. I cope quite well with being in the airplane hold for 10hrs; it’s worth it as I just love the English fields. I am beginning to think about my next trip in September. Not sure how many more trips I will do as I am now 9, perhaps I will be staying with my ‘sister’ in Vancouver BC instead. I just finished reading a book about a golden retriever named Nickie.It was a very good book, maybe your mom should read it to you. It’s called The Darkest Evening of the Year by Dean Koontz. There are several beautiful smart retrievers in the story. When I read this paragraph, I thought of you and your late brother Madison: “Golden retrievers are not bred to be guard dogs, and considering the size of their hearts and their irrepressible joy in life, they are less likely to bite than to bark, less likely to bark than to lick a hand in greeting. In spite of their size, they think they are lap dogs, and in spite of being dogs, they think they are also human, and nearly every human they meet is judged to have the potential to be a boon companion who might, at any moment, cry Let’s Go! and lead them on a great adventure.” I look forward to your next blog. Your posts are much more interesting than your mom’s but don’t tell her. Hi Scooter, my name is JJ, I am a Yorkie. I too had trouble at doggy school, got into trouble for barking and not paying attention in class. My mom had to teach me for a long time after class but I finally got the hang of being good most of the time. So pay attention and you will learn much faster and get more treats for being a good boy. Scooter, if I didn’t know any better I would swear you were a labrador in long fur. You are so very handsome and smart and young. You will learn in time all that is expected of you. You have a wonderful loving family and all puppies need Exercise, Disipline and Affection to be happy and balanced. Keep those blogs and puppy kisses coming. You just tickle me to death. Hi Scooter, wish we loved closer as I think we would have lots to talk about. Your blogging makes my mom giggle! You are both toooooo – adorable. I love your posts and I really enjoy reading what the people who read your posts – post. I shared with everyone before that we used to have a part GT named Sandy. Well, people always asked me if she was a “watch” dog and I would tell them “yes.” If someone broke into the house she would “watch” them take things that were ours to their car and possibly lick them goodbye and “watch” them leave. She couldn’t climb trees, either. But, she had a cat brother – named Emir (long story) who was an indoor cat and loved watching birds, squirrels and other animals that passed by the house. One day the front door was opened and this one particular squirrel that used to sit on the porch railing and bark at Emir was on the porch. Well, before any of the three of us, cat, squirrel or me realized it the cat ran across the porch over the rail and followed the squirrel up a tree. THEN Emir realized he had never climbed a tree before and didn’t know how to get back down. True story – he held onto the trunk for over an hour before he had the courage to back down the tree. It was sweetly, sort of pathetically – funny. A short time later a lovely Golden Retriever trotted up to the window, saw the sign and went inside. He looked at the receptionist and wagged his tail, then walked over to the sign, looked at it, whined and pawed the air. The receptionist called the office manager. He was surprised, to say the least to see a canine applicant. However, the dog looked determined, so he led him into the office. Inside, the dog jumped up on a chair and stared at the manager expectantly. The manager said, “I can’t hire you. The sign says you must be able! 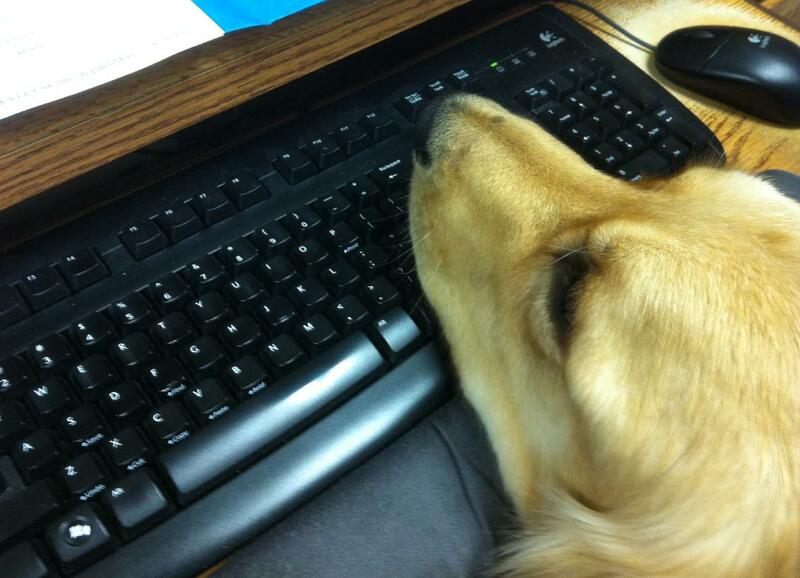 to type.” The dog jumped down, went to the typewriter and proceeded to quickly type a perfect business letter. He took out the page and trotted over to the manager, gave it to him, then jumped back up on the chair. you Madison once in a while.Madison.was a great doggie..I used to write him. Scooter! We are so glad you are able to live with Ami. i’m sure you will have her trained very quickly!! I look forward to hearing more of your stories!! Hi Scooter! Sam here. I’m an Irish setter rescued in february 2007. and my forever home has two more irish setters. I gaze at my mom all the time. After all, it was the Moms (and Dads, but moms are cushionier) who rescued us. I was taught by my first family not to lick faces, but this family loves it, so I am learning. You are a fast learner. I don’t have squirrels where I live, but I protect Mom against birds. Hi Scooter, My name is Lacey and I am a 138 pound Great Dane. My human parents never sent me to obedience school, so I am not as educated as you are, but I wanted you to know that you can train your parents to behave the way you want them to! When I was adopted at 15 months old I was told that I could not get on the couch. But I finally wore them down. I’m four years old now and when my mom and dad want to watch TV, mom sits at one end of the couch while I sprawl out on the rest of it. She rubs my tummy and tells me what a good girl I am. Daddy doesn’t even try to sit on the couch with us. He wheels in an office chair and sits next to us. I put my paw out to him all the time to make sure I am touching him and to let him know what a good dad he is. So hang in there, it doesn’t really take too long to train your parents. Keep sending updates, we love hearing from you! Good morning Scooter, you have a beautiful long neck, gorgeous coat and a smile that lights up the world! I’m so happy for you and your family, it’s good to give and receive love isn’t it? I have four boys and you know, you’re correct, it is difficult to behave in a vet’s office when everyone else seems so nervous around you. My boys are SO happy to meet other dogs that they can be a bit intimidating so we all have something to work on, never fear, with love and patience and practice, it will all come together for you. I wish you the best of health and happines and know that you are always being loved and protected by your mom and dad. Scooter, don’t worry about the vet visit. I’ve done that wall and ceiling thing a time or two at the Dr. (and I’m a human). You are already a wonderful “bloggy doggy”. I look forward to your next chat. Love your stories. My scooter is at my feet while I write to you. He has had a very ruff day. He barked at the vacuum and then watched the carpet cleaner machine. Then, his boy came twice to help move furniture. Scooter and Monroe (the grand dog) are so sorry to hear that you can not get on the furniture after all it is FURiture. Watch out for loud noises the next couple of days. The Fourth of July is very hard on doggy ears. Scooter, you look so happy, handsome and alert in school. I bet you’re the teacher’s pet! So nice to hear from you. I am so glad you have another Blog Dog. I miss Madison a lot. I have a yellow cat named Clementine but she doesn’t like to blog, she says we should be able to read her mind without her having to do things to the keyboard. I love reading your blog and know you will get the hang of doggie school. My supervisor at work has a dog named Scotter but she is a lab/hound mix. I have other friends with goldens and once in a while I stop at the local bakery and get some doggie donuts for them. I would send you some but I think they would get smashed in the mail. I am so happy you joined the Simms family – I think they really, really needed you! Be a good boy, and continue “kissing” your Ami at every possible opportunity. She may not be furry, but she DOES love you! Thanks Scooter for the update on the doings at your new home. I think there is something that those NC squirrels learn from birth which is how to drive a doggie nuts! As for the furniture…here it seems to belong to those pesky cats who manage to leave fur everywhere. Scooter….. you hang in there. I have accomplished getting to snuggle up next to Daddy on the couch when Mom gets up. AND it’s nice and warm. However, I’d rather run and chase stuff…that’s what I do. Even though I’m a year and a half, I have a LOT of get up and go….that’s why I get to go to doggie day care when Mommy wants some sewing time. I want her to throw the ball and chase me and then I’ll chase her and then we’ll play all day long. Scooter is a very good-looking doggie. My mom told me it’s alright to write to you as I’m getting used to my new family too. My name was Roadie when I lived with my first family. It didn’t work out there and they were going to take me back to the shelter. My new mom said she wouldn’t let that happen to a good girl like me and mom and dad took me home. Dad said no dogs on the furniture. I used my puppy dog eyes and now he lets me sleep on the bed. You just have to learn how to work it. I’m only six months old, but I’m learning fast. Oh, I almost forgot, my new name is Rosie. I’m sure we will become good friends. Welcome, Scooter, to the World Wide Web and the land of quilting. Everyone means well who tells you to keep on trying to get on the couch, but I know that your new Mom can be very stubborn about a few things, and that is one of them! She will have special places for you to rest…just not on the furniture. Madison soon got used to it, and there are very many adventures in store for you with the Simms family. Just you wait and see. I am “scooting” into my Mom and Dad’s hearts since our Gold-EE crossed the Rainbow Bridge 6 weeks ago. She was my grest, great Aunt, and a Service standard poodle for Dad. I’m glad I had a year to start learning from her what Dad needed. He gives me lots of praise. We still miss Gold-EE a lot…I can tell because Dad gets water in his eyes and pets me softly. She was with him 14 1/2 years, so I still am learning. You will too, I KNOW it.